What would the average medical doctor have to do to earn $86? Well, according to Medicare, that’s the amount the doctor will be paid if he or she spends up to thirty minutes talking with a patient about their wishes for end-of-life care. The Centers for Medicare and Medicaid Services (CMS) approved this billing code in October of 2015, reflecting the slow but steady movement in our society toward acceptance of death as a natural part of life. A recent Kaiser Family Foundation Health Tracking Poll found that 90% of the public feels that doctors should engage in end-of-life discussions with their patients, even though fewer than 17% have actually had such talks. Still, agreeing that it’s a good idea marks a significant sea-change from the days when death was only whispered about in polite society. When you consider that death is the one commonality that all humans share, it’s perhaps surprising that this subject has been taboo for so long. But there are definite signs that the prevailing prohibitions about the d-word are slowly falling away, especially as the largest-ever cohort of people over 65 contemplate what comes next. The Boomers seem to be a bit more willing than their predecessors to look the grim reaper in the eye and ask what he’s doing hanging out in their back yard. For example, would you accept an invitation to a meet-up, featuring tea and cake and a dozen folks talking about death? That’s the concept behind the Death Cafe movement, a social franchise that has sponsored 2,893 events in 33 countries around the world since the first one took place in 2011. The stated purpose of a Death Café is to “increase awareness of death to help people make the most of their (finite) lives.” The events are free from agendas or featured speakers. A facilitator will encourage participants to speak about their own experiences and perspectives around death and to listen with respect while others do the same. If you find this intriguing, you can attend a Death Café this week in Montpelier, VT; Asheville or Brevard, NC; Grants Pass, OR; Venice or Sarasota, FL; Marin, CA, Boulder CO; Washington DC or New York City. If you’re hesitant to speak about death in public with strangers, you might start a bit closer to home by investigating The Conversation Project. This website provides a place for people to explore their personal feelings about death and to share, in writing, their wishes for their own end-of-life experience. Besides giving you the chance to read other people’s stories about their experiences, the site also includes a handy guide that you can print and take with you to help you start a conversation with your doctor. Because at some point in your ruminations about your own ending, it will dawn on you that letting your doctor in on your feelings about end-of-life medical treatment is probably a wise move. After all, he or she will most likely be involved in your care at some point in the progression from wellness to death. Which brings us back to the matter of the $86 Medicare charge, and your doctor’s own level of comfort with talking about death. It seems reasonable to think that members of a profession that literally encounters life and death matters on a daily basis would be well-versed in the language and the emotions involved. Not necessarily so, when you consider that there are only about 6,500 U.S. physicians who are board certified in hospice or palliative care. Compare this to the more than 200,000 board certified internists and you get an idea of just how few that is. While doing research for a book, Dr. Robert Cowgill, who was one of the first hospice medical directors in Georgia, contacted 122 medical school and 34 nursing schools to ask about coursework offerings in palliative, emotional and spiritual care of the dying. Only 8 of the medical schools and none of the nursing schools he contacted had mandatory courses; only 16 offered electives in these topics. There is very little evidence of palliative care or end-of-life training being part of physician’s formal clinical rotations. This deficit is slowly being addressed with the development of tools to help doctors engage more naturally in these types of talks with their patients. 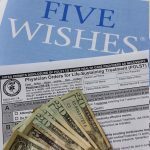 The use of POLST (Physician’s or Practitioner’s Orders for Life Sustaining Treatment), a medical order indicating a patient’s wishes regarding interventions that are commonly encountered in a medical crisis, is becoming more common, especially in cases involving terminal illnesses. Still, your own doctor might be surprised and possibly a bit uncomfortable if you ask to discuss the topic during your next office visit. $86 might not be enough incentive to get the conversation started.